Oil prices increased significantly due to increased demand for energy source and a decline in the USD. In the second half of August, the instrument gained more than 8 dollars per barrel, reached a key level of 79.50, rebounded and went downwards. This level is the strongest resistance which the price tried to break three times. An additional catalyst for the growth in “black gold” was data from the US Department of Energy on the decline in production and the number of active rigs. In the current trading week, the price fell by more than $3.5 per barrel due to the strengthening of the USD. Today, traders will pay attention to US releases on unemployment and Nonfarm Payrolls. 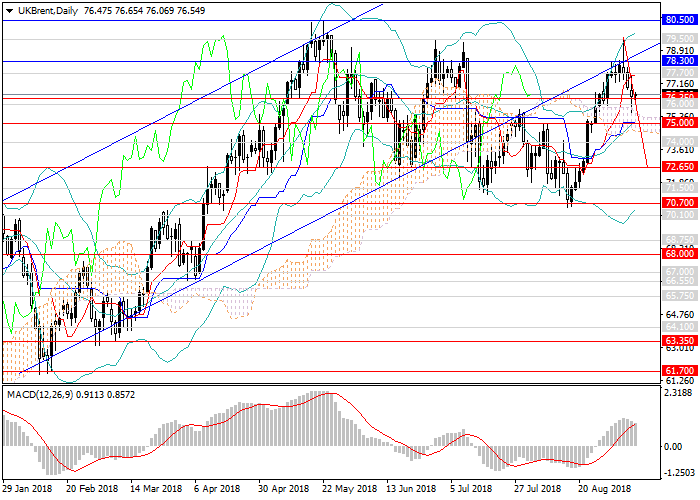 The maintenance of broad sideways consolidation within the channel of 70.70–79.50 is possible, and then the trend will narrow to 72.65–78.30. Technical indicators confirm the forecast, the volumes of long positions of MACD are falling, Bollinger bands are moving horizontally. Resistance levels: 77.70, 78.30, 79.50, 80.50, 81.30. Support levels: 76.35, 75.00, 74.00, 72.65, 71.50, 70.70, 70.00. It is relevant to open short positions with the target at 70.70 and stop loss around 80.10.